I've mentioned before that I'm a horrible gift giver; Robbie blows me out of the water every time (well, except for maybe his birthday last year :). 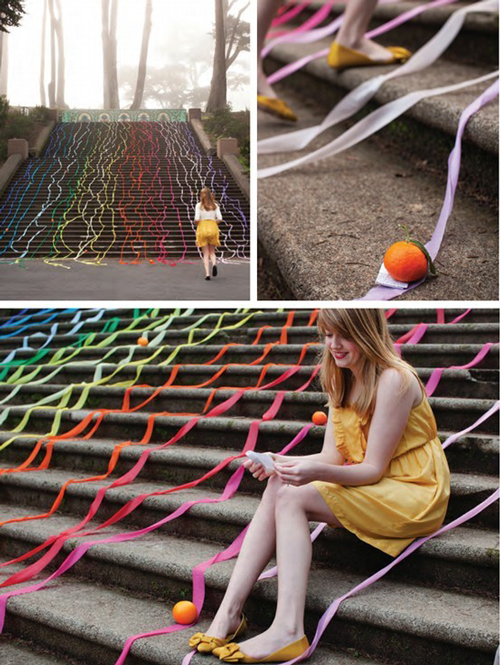 That's why I love Jordan Ferney's streamer and yarn installation DIY. It's a simple, inexpensive way to make someone feel special, which is a perfect combination for those of us who can be DIY challenged. I would love to stumble upon these pops of color at the park, especially once I found the treasure waiting for me at the finish! Would you set this up for someone special? The rule-follower in me would have such a hard time! P.S. Aren't those trees at the top of the staircase gorgeous?